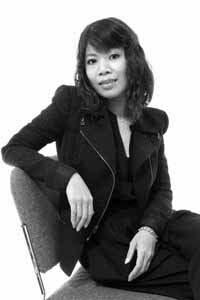 Nina Nguyen Hui, MFA Fashion Design, was born and raised in Da Nang, Vietnam. While studying at Academy of Art University, she interned atwon a competition to intern in BCBG Max Azria where she created samples using macramé and other craft techniques. Her looks were featured in the “Celebrating 30 Years of Hervé Léger” Collection at the 2015 Graduation Fashion Show. Her thesis collection is inspired by sea corals and the organic nature of their patterns. Sea coral can be fierce and unforgiving but also exhibit a soft beauty that is both powerful and fragile. Her interest in learning various techniques shows throughout her designs that feature elaborate tambour beading, embroidery, and laser cutting. The accessory de rigueur are the acrylic eyewear designed and created by Yolanda Chiu, MFA Jewelry and Metal Art.